This CD+bluray package contains the debut solo album by Uchida Aya (内田彩). The CD tracks are as follows. The bluray contains around 28 minutes of video. 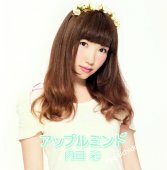 promo video of "Apple Mint"
The lyrics booklet also contains several color photos of Aya. There were advertisements for this CD in Akihabara at Gamers, Toranoana, and Animate.